emergency led road flares is an essential piece of equipment for police, firefighters, EMTs, rescue services, first responders, members of emergency response teams and the general public. 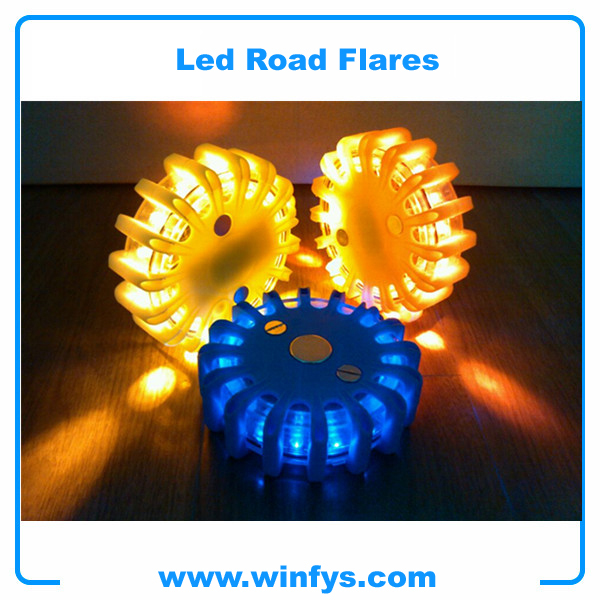 emergency led road flares casing is constructed of super high strength plastic: PC, TPE and TPR. emergency led road flares have 16PCS super bright LED bulbs, working life is more than 100,000 hours; Using high-capacity battery CR123 as power, built-in IC chip control LED flash. · As an underwater flashlight. The Emergency LED Road Flares has nine different signal types, two of which serve as a LED flashlight. · Boaters equip their personal watercraft with the Emergency LED Road Flares to use as an emergency LED light to signal for help. · For emergency responders, this emergency road light is sure to slow or stop traffic. The emergency road flare is indispensable to police, firefighters, rescue personnel and others serving as emergency responders. · Whether driving a car, truck, boat or other vehicle, the Emergency LED Road Flares is an ideal emergency signaling device. Its versatile design allows it to lie flat on any surface or on its edge to accommodate any emergency signaling need.